Since that time Manjushri Centre has been Geshe Kelsang’s spiritual home, where he has given thousands of teachings. Many of these teachings have been published in 23 highly acclaimed books on Buddhism and meditation, including the upcoming title, The Mirror of Dharma. Over the years, Geshe Kelsang has founded more than a thousand meditation centres and groups in over forty countries, and has established three study programmes – the General Programme, the Foundation Programme, and the Teacher Training Programme – to be taught continuously at these centres. 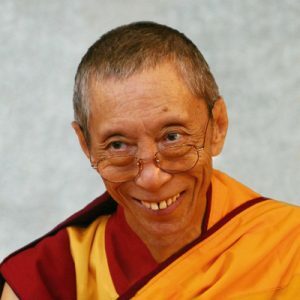 Though he has now formally retired as Spiritual Director, even in his eighties he continues to work tirelessly to spread the precious teachings of Kadampa Buddhism throughout the world with the intention that each and every living being will eventually experience the supreme permanent mental peace of enlightenment.